“Cleanse” and “Detox” have become buzzwords, especially to today’s health and fitness-conscious crowd. But what are these two about? More importantly, what are the benefits and the natural ways to help your body in its daily detox functions? Toxins are harmful substances that find their way into your body via pollution, pesticides on and in your food, pollutants in water, stress and more. Once inside the body, these toxins wreak havoc to your system—from damaging cells to messing with hormones—and trigger health conditions such as constipation, stubborn weight gain, headaches and muscle aches. To counter these effects, the body works and interacts with other organs (specifically the liver and kidneys) to neutralize and remove toxins. This is the body’s regular detoxification duty. 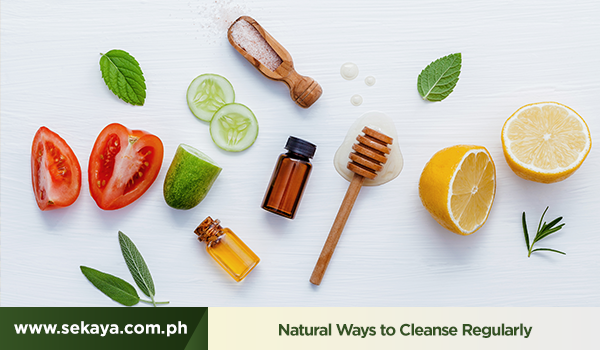 Although they’re used interchangeably, cleansing refers to eliminating junk from your diet to help your body’s natural detoxification process. While we can’t completely eliminate toxins from our day to day, there are easy steps we can take to reduce our exposure. What you put into your body is, of course, a top source of toxins. • Use healthier oil options such as extra virgin olive oil, coconut oil, avocado oil and hemp oil. Food cannot detoxify your body. Eating healthy foods however, can help your liver and kidney do their job better. Fasting gives the digestive system a break. Simply trading your heavy meals with fresh fruits and veggies for a couple of days should be helpful. But make sure to clear it out with a doctor first. 4-5 liters of water is ideal for flushing out toxins. Not only is it effective at removing impurities but drinking big amounts of water can be beneficial to multiple body functions and processes. A trick to drinking more water is adding natural flavors with fruit slices and botanicals. You can throw in some orange slices, mint leaves and even strawberries. Sekaya Liver Vitality is a therapeutic botanical brew that aids the liver in its detoxifying duties. Getting the waste out is one of the best ways to support the body’s detox process. A weekly workout at the gym or a simple 30-minute run outdoor should help you get rid of toxins. A study suggests that heavy metals such as arsenic and lead can be excreted through sweat. The ideal for going to the toilet is around 3x a week. It’s very important that you do it regularly as it is one of the best ways that the body flushes out wastes. Sekaya Regular Move is a subtle and earthy infusion of botanicals that work together to promote ideal bowel movement. Look to nature’s gifts for your everyday healing and empowering needs. Have a sip of Sekaya Botanic Infusion.